Time stood still for another chance, fell victim to the morning light. Crafts Spells, an indie pop band based out of Seattle, Washington, started out as the bedroom project of Justin Paul Vallesteros in his hometown of Stockton, California in 2009. Bored with life in his suburban family home, Vallesteros began experimenting with tracking simple guitar and synth lines. This turned into the dreamy and nostalgic pop sound that defines Craft Spells, which quickly made its way around the blogosphere. Vallesteros's music caught the attention of Brooklyn-based record label Captured Tracks, who would release the Beauty Above All EP. Work on the debut LP Idle Labor began in early 2011, and was officially released on March 29th. After playing a few well-received shows, Vallesteros relocated to Seattle, Washington. Craft Spells is now a four-piece band that includes Peter Michel on drums, Jack Smith on bass, and Javier Suarez on guitar. Stockton is not known for being a vibrant, cultural hub in California. It's a mid-size town in the heart of Central Valley, and a far cry from cities like San Francisco. So it's no wonder that Justin Paul Vallesteros, a native of Stockton, started the band Craft Spells as a bedroom project. Both dreamy and nostalgic, he uses drum machines and synth-pop riffs inspired by elements of 80s New Wave--sounding like something John Hughes might have hand-picked for the soundtracks to Breakfast Club or Pretty In Pink. And with his brooding voice and lovesick lyrics, Vallesteros seems to channel the ghost of Joy Division's Ian Curtis. The lovesick vibe even extends to the artwork for debut album, Idle Labor. It's a bouquet of roses, perhaps a symbolic gesture for trying to woo a lost love. This sentiment is echoed in the song “Your Tomb,” with Vallesteros singing, “I'll throw a rose to celebrate your end, but when you rise from the dead I will love you again.” Taking a U-turn out of a lovelorn abyss and into a more jubilant mood is the synth-heavy “Party Talk.” It starts out with a few trickling notes, before turning into a downpour of synth-pop fun layered with subdued, tropical beats. Still, it's not a keg-fueled rager that Craft Spells has in mind. It's the type or party that you might go to by yourself, awkwardly making small talk to the first nice-looking person you see. Vallestros gives us a hint of this by asking, “What's your name? Please tell me who you are. Is this new? 'Cause I'm falling for you.” What started out as a bedroom project is now a full-fledged band. Live, Craft Spells is a different animal—but without losing its core feel. The synthesized elements on the recording are replaced by Jack Smith on bass, Peter Michel on drums, and Javier Suarez on guitar. With a nearly endless amount of music software, it's easy for anyone to make music that sounds halfway-decent. But with their live performances, Craft Spells prove that they're talented musicians outside of a laptop in a bedroom. Fresh off of Craft Spells' first-ever tour, where they opened for their Captured Tracks label mates Beach Fossils, we caught up with frontman Justin Paul Vallesteros to talk about the do-it-yourself music process, getting the hang of life as a working musician, and why Dennis Wilson is his favorite Beach Boy. Band of the Day: Question: You recorded Idle Labor on a laptop in your bedroom, but did you feel that it limited you in the creative process? Justin: Actually, no. When I was recording in my bedroom I felt like I was open to doing anything, really. The resources of the internet, it's all there. I feel like if I was in a studio, I'd kind of be, like, trapped to do one certain thing. When I was recording it was mostly all in the moment, too, so it all got captured. Band of the Day: How do you think the album might have turned out if you recorded in a traditional way? Justin: I think it would've sounded even better, quality-wise. But I think it was a good move for the first record. 'Cause the whole record was almost like a diary of some sort, so it was very personal. I wouldn't want it any other way for the first release. But for the next record, I feel like a studio would be a really good idea. It'd be pretty cool! Band of the Day: Do you think the ease of the DIY self-recording approach, overall, is a good thing or a bad thing? Justin: I guess it's a good thing, but I dunno. I mean, when I started I didn't do this to get recognition or anything. I just put it up on Myspace to share with friends in Stockton, and for some reason people caught onto it. Now I'm really happy that I get to share this with the rest of the world. But I feel like there's some gems out there that will get easily looked over. I'm not calling myself a gem, but there's bands like Washed Out. I mean, who would've found him if the internet wasn't relevant? Band of the Day: As a musician, how have things changed from being a one-man band to a full-fledged band? Are the other members all part of the songwriting process now? Justin: I'm still writing on my own, it's just that the band members help flesh it out now. When it comes to recordings, they always have good opinions or options on what the songs should turn into. It's really good because when you get the full flavor of four people's opinions on one song, it can get kinda stressful but it could also turn out to be the best song, you know? 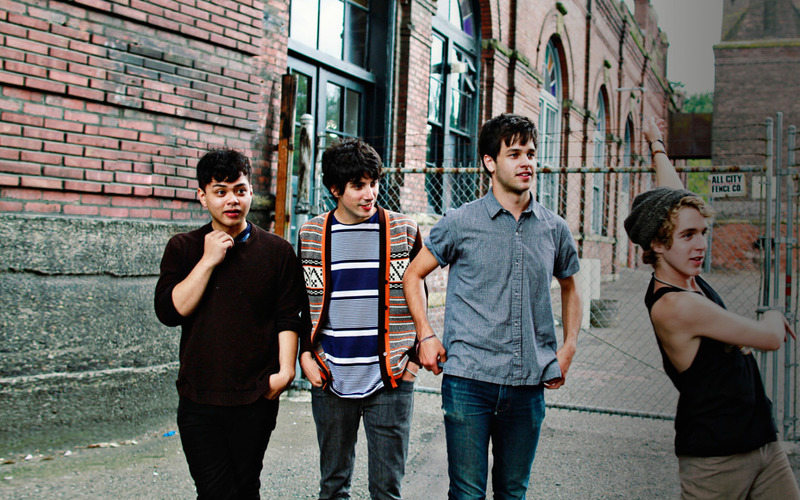 Band of the Day: Even though this was your first tour, Craft Spells seem confident on stage. But was there a time when you weren't as comfortable? Justin: Yeah, the first couple of shows. This was our first tour, so before that we had played zero shows (laughs)! So it started out really awkward in Seattle, and all our friends and family were there, but once we got used to the ropes, especially with Beach Fossils, they taught us to be more confident. They were like big brothers to us the whole tour, so we just got more confident as the shows went by. And we drank more (laughs)! So that helped. Liquid confidence helps a lot! Band of the Day: How did you come up with the Idle Labor album cover? Justin: The record kind of had a whole theme to it, and I felt like the flowers were a good representation of love, death, and forgiveness. A lot of people compare it to Power, Corruption & Lies by New Order. I mean, I do love New Order, and of course we're influenced by them heavily, but it wasn't an homage or anything. I just felt like it was the perfect symbolic representation of what the record is. Band of the Day: When did it really sink in that you could make a living as a musician? Band of the Day: Somebody left the comment on your “After The Moment” music video on YouTube that “This song got﻿ me high, on sound alone.” Have any songs done that to you? Justin: Oh, man, yeah! I mean, a lot of old Modest Mouse records get me on a weird trip or high. It brings me back to being sixteen, and skateboarding with my friends. It makes me really happy, and that's like early Modest Mouse stuff that I really love. But even the new stuff, too. It gives me lots of good memories. They're my second favorite band, after Beach Boys. Band of the Day: What's the first music video you fell in love with? Justin: I think it was Madonna's “Like A Prayer.” It was a really awkward video (laughs), but it was super awesome and epic! And the song is awesome, too. Band of the Day: What was the last YouTube video to make you laugh? Justin: (laughs) Oh, there was this old Playstation 1 game about those razor scooters, you know? Well, Playstation made a video game about it, and somebody made this really short clip of some dude jamming on the scooter saying stuff like, “Whassup, y'all?” and then, like, he falls off and into the air and he starts, like, screaming super loud (laughs)! It's just a short clip, but it's super funny. Band of the Day: Has the move from Stockton to Seattle had an influence on your music process? Justin: I was more bored when I was at home, so I was just really more set on recording music only. But here, I'm getting used to meeting new people, and the music scene here, and meeting everyone in the music scene community. Band of the Day: Is it pretty supportive? Justin: Yeah, it really is! And they're all young kids, too, which is really awesome. Everyone's really passionate. I mean, my roommates work at the record store here, so there's a lot of music going on here in Seattle! Band of the Day: What's been the reaction of your friends and family members about being in Craft Spells? Justin: Oh man, they've been through it all! I mean, they're really stoked. They understand that I've had to move out from my parent's house in Stockton. And then they saw us play at Slim's in San Francisco, and I think that that night was a really good night for everyone. I think that everyone felt like rock stars that night (laughs)! I mean, 'cause the crowd was ridiculous! And my parents were just really shocked. I mean, because I played that stage when I was 15, for a Battle of the Bands thing. So it was weird being on that stage again, and being 23. Band of the Day: You came up with the name Craft Spells came up because of a fascination with Shamanism. One of the roles of a shaman is to preserve traditions through storytelling and songs. What kind of legacy would you want Craft Spells to leave 200 years from now? Justin: I'd like people to know us for our aesthetic, and our quirkiness when they first meet us as people. I don't think people have a good grasp of Craft Spells yet, of the four of us. I think the way we interact with each other, people need to see that because it's pretty funny—our stage banter is ridiculous (laughs!) But also, I think it's kind of like the records will always be like my diary. Idle Labor is a great introduction. I mean, it covers my ages from 18 to 23, so I think that will continue. I think people will just get to know me as the records go by. Band of the Day: So then when you're 80 or something, do you think you'll be writing about wearing Depends and your teeth falling out? Justin: (laughs) I dunno, but I will definitely keep some recordings behind that will never be released. You know, I was just talking to one of my roommates and was saying that some songs are too personal, and maybe I should just keep them to myself forever. And then maybe one day, I dunno, if somebody cares enough to share it when I'm gone, they can. Band of the Day: And speaking of death, what deceased musician would you want to commune with if you had the power? Justin: Probably Dennis Wilson of the Beach Boys. Everyone else in the band was really happy, and Brian Wilson was the most idle-minded, and then there was the drummer who was just super crazy. He released two records that were just super depressing. He just seemed like a really dark dude, but he made really good music. And he was actually supposedly the life of the party when everybody hung out, so it'd be really cool [to speak to him]! Band of the Day: Do you feel like you kind of relate to him? Justin: No, definitely not in the same way. He's just a really interesting character because he didn't really get to show himself, as the drummer. And Dennis Wilson was pretty cool during the 60s, too. He was actually the only one that surfed! Band of the Day: You're on a vision quest, but can bring an iPod loaded with just one song to soundtrack your journey: what song would you choose and why? Justin: Oh, man! Probably The Beach Boys, “I Just Wasn't Made For These Times.” Because, either way, wherever I'm traveling to, it would just make sense. Band of the Day: Let's say Harold Camping was right about the world coming to an end. If that was the case, what would be the last Craft Spells song you'd want to perform, and where would you perform it? Justin: It would be “Beauty Above All” and I'd like to perform it probably at Giants Stadium [in San Francisco]. This song, I wrote it probably after my fourth time watching “Harold & Maude,” and so everyone would be dying and what would be left behind would be...I dunno, this song has a strong meaning of, you know, if you're not in a serious relationship, or if someone you love has passed away, you always look towards beauty above anything. And you can enjoy life by just focusing on beauty. I feel like a lot of artists do that already. I feel like I can live my whole life without being in a heavy relationship, with just focusing on how beautiful the world is, and then once I finally meet someone else who also sees how beautiful the world is, then I think that's the perfect time!